This enjoyable, easy-to-learn card game cleverly blends the rules of poker with solitaire. The object of the game is to identify poker hands within a deck of cards that has been dealt and evenly spread out face up. Once a hand has been marked to play, the cards that make up the hand are removed, points are awarded, and any cards above them fall down to take their place. 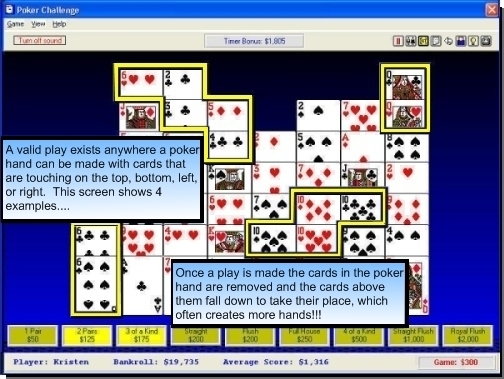 (The game's screen shot shows an example of the concept). It will challenge you over and over with countless possibilities of play, as each deal is unique, and there are many different ways to complete a game. Once all play possibilities have been exhausted, the game will automatically end and calculate your score with exciting special effects. In fact, in addition to the concept of the game itself, it will be sure to entertain you with windows that snap, pop, slide, and explode on and off screen. Game rules are presented when the game starts (and in just one screen of information) so that you will find yourself actively playing the very first hand dealt. As your skills advance, you will be challenged to think several moves ahead to build more (and better) poker hands within the set of constantly shifting cards. The challenge continues as you're awarded bonus points for creating as many different hands as possible, for finding poker hands that yield the most points, and for removing as many cards as you can. To add yet another strategic element to the game, you are initially given a timer bonus that slowly ticks away to reward quick completion of each game. To help you better measure your skills, the game tracks account balances, average scores, and high scores. Are you ready for the challenge?